Nightwish showcase their Vehicle Of Spirit live DVD in Finland. It’s just after lunchtime on a cloudy Saturday in September when Prog joins a group of around 20 journalists in Finland for a unique coach trip. 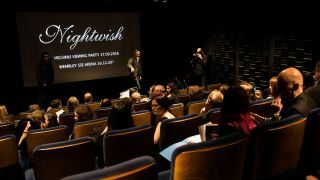 We’re on our way to the National Audiovisual Institute (aka Kansallinen Audiovisuaalinen Instituutti) for a screening of Nightwish’s forthcoming live DVD Vehicle Of Spirit. It’s the first time that anyone outside the band and their management has seen the edited concert footage so to say we’re excited would be an understatement. It’s Nightwish’s 20th anniversary this year and to celebrate, they’ve been touring all around the world. In fact, next month marks the end of their 18-month schedule with a series of shows in North Asia. This DVD captures some of the live highlights from the last 18 months. The institute, often abbreviated as KAVI, is a short drive away from Helsinki city centre. It’s involved with film restoration, archiving audio-visual material, and also plays an important role in educating visitors and students on the history of the visual arts. Prog takes a lift up to the fifth floor of the building and is wowed by the sight of display cabinets full of vintage audio and visual equipment, which include early TV cameras. One-third of Nightwish are here as well: founding keyboardist Tuomas Holopainen, bassist/vocalist Marco Hietala and drummer Kai Hahto, who also plays with Swallow The Sun. They pose for photos as we grab shots of Salmiakki Koskenkorva – a liquorice-flavoured Finnish liqueur – and head into the small, on-site cinema for the screening. A few hours later, a very happy and visibly pregnant Floor Jansen also arrives to meet journalists. “Welcome!” says the Viking-like Marco Hietala, as we take our seats in the modern auditorium. He explains how the DVD is split into three sections: there are two full concerts – last year’s sold-out show at London’s Wembley Arena and their largest-ever production at Tampere’s open-air Ratina Stadion in Finland – plus bonus content, with performances taken from around the world, and an exclusive interview with evolutionist Richard Dawkins, who guests on their most recent album Endless Forms Most Beautiful. The bassist later tells Prog that he and Kai Hahto have been involved in overseeing the audio mix with their FOH sound engineer Kimmo Ahola. “There’s still some stuff that needs to be finished,” he says. As a result, the release of the Vehicle Of Spirit DVD has now been pushed back to November 25.